This second issue of X-Men red, while still working on building the team, focuses mostly on a new character called Trinary and the direct result from last issue with Jean being framed for murder on tv. This issue tends to move a tad bit slower than the previous issue allowing some of the characters to relax and breath and have a few character interactions as well. The biggest thing in this issue will be Trinary, whose mutant power is to be a technopat and as a result of using her powers in a big way gets her arrested in India. While we don’t get to see just how powerful she really is, she does manage to get through Wakandan computers so that’s something. It’ll definitely be cool to see how she plays out on the team later and with the way this issue ends, her powers will probably come into play in a big way at the beginning on the next issue. 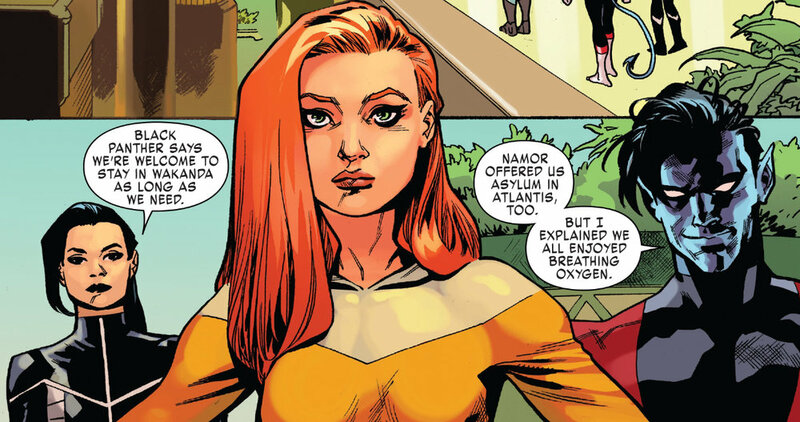 The rest of the issue is the team handling being in exile, it’s not a big part of the issue and nothing particularly major happens here but it’s worth noting that we get to see the characters relax and interact a little, specifically Gabby who is always a blast when she’s on panel. But of course the team goes to rescue Trinary and, as things with the X-Men always goes, things go south.